As anthologists always do, I wish I’d had more space to include other stories that I loved published during the year, especially novellas, but I think that these selections are very strong. The cover shown here is not the final version, which will add author’s names etc. This entry was posted in Like Show Business and tagged Jonathan Strahan by Mike Glyer. Bookmark the permalink. I think that “Strange Dogs” by James S.A. Corey ought to get a little love on the various best of year lists. Part of the ‘Expanse’ series, but it holds up pretty well as a stand alone story. A story of alienation, feeling an outsider and trying to fit in. 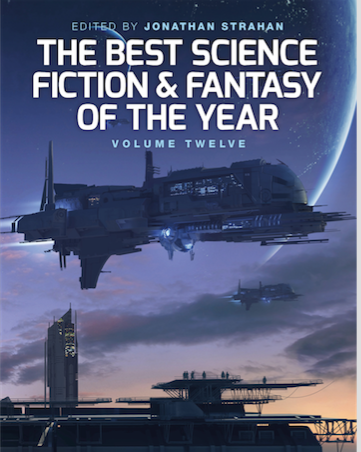 I loved this story; Benedict impressed me tremendously with both this story and her second in F&SF (“Water God’s Dog,” a powerful story alluding to late-stage capitalism), and I’m glad to see both story and author getting a recognition boost. Benedict will definitely be on my Campbell list. I found this one very bewildering, although I read it twice. It’s got an interesting, intimate voice, but I was completely lost trying to figure out what was actually going on, or what I was supposed to take away from the piece. I’d dearly like to see cogent takes on this story; if anybody has ’em. I definitely liked this one. A morbid story, about how people’s skills are becoming less and less valuable, how automation is hollowing us out — with a twist I really enjoyed. Thriller-ish story about body-swapping, and buying others’ bodies for personal use. Fun and peppy. Ends on kind of a weird note, sympathetic to somebody that doesn’t seem to merit it at all. I think I’ve kind of gotten a bead on Wolven: he writes stories that feel like Black Mirror episodes. And I have a bit of a problem with that, since I mostly don’t like Black Mirror episodes. Those I’ve seen mostly feel like an echo-chamber of old If-This-Goes-On short fiction, with a simplicity and an earnestness I find intensely unsatisfying. Less speculation; more wide-eyed exaggeration. And that’s a lot of the Wolven stories I’ve read, too. This one is almost a twin to Black Mirror‘s “Nosedive,” about people being able to rate each other for everyday interactions. The mechanism, and use of the premise as a horror trope, are almost identical. That being said, where “Nosedive” focuses on how easy it is for a small slip to trigger a downward spiral (which I think is a powerful message re:poverty), “Confessions of a Con Girl” focuses on how being kind and compassionate can be interpreted by others as anything but. There are a few… weird… notes along the way. But the ending is quite powerful. A story with a lot of interesting elements, all surrounding Bilqis — eking out a harsh existence in desert exile. Plot-wise, the story didn’t quite come together for me — some strands drifted off; others appeared out of nowhere — but it was engaging; Bilqis’s character and situation are interesting, and IIRC the author plans to write additional stories building on this one. A fun, zippy story, about an outdated robot being sent on a kind-of-critical mission; zaniness ensues. All in all: Most of these stories really weren’t favorites of mine, but there’s definitely something interesting to each of ’em. Thank you Jason for the Collated Contents! Super helpful.